It’s difficult to like a book that perpetuates the idea that women need love like bread needs flour. 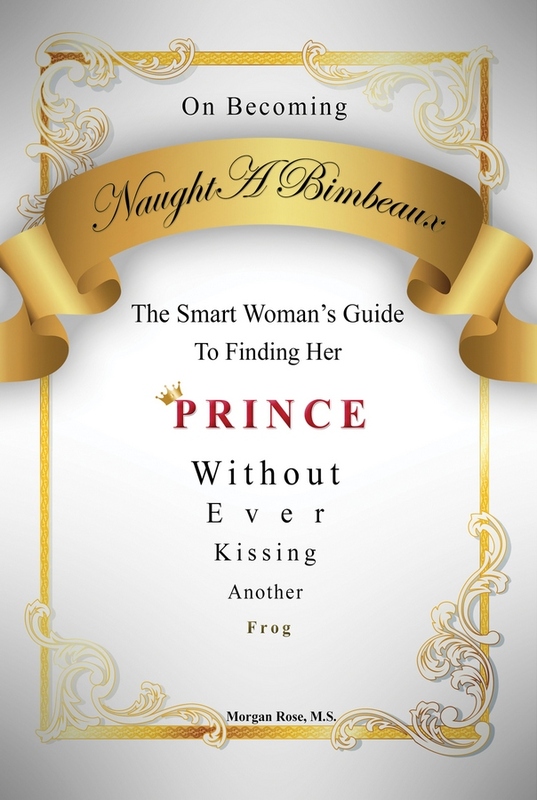 However, Morgan Rose’s tell-all book, On Becoming Naught a Bimbeaux: The Smart Woman’s Guide to Finding Her Prince Without Ever Kissing Another Frog gives a slight twist to the stigma of a female’s need for a male companion in an easily accessible and engaging tale of the pathway to love. Rose, who has a master’s degree in psychology, seems to know more about the female and male psyche than the general population and does have some useful and empowering points for us females. Each part is put in the order of a follow-along journey beginning with “Part One: Me,” where she acknowledges the most important part of the journey to finding Mr. Right: loving yourself. According to Rose, love with someone else ultimately begins with finding the strength to love you first. Rose shares that in order to love yourself there are certain notions on love and life that women need to decide for themselves such as: excavating our own truths on love, accepting the first love of your life, differentiating what our love lives should be like to what they are and will be, trusting your intuition and how powerful any women is and can be. Rose also includes a part titled “Part Two: The Bridge,” which includes unique perspectives on the biology on bonding and graphology, or the study of handwriting. The chapter on the biology of bonding was by far the most interesting chapter in the entire guide, and Rose can be applauded for her ability to take the complex chemistry of the brain and make it so easily comprehensible. Although interesting, the usefulness of this chapter is questionable and I can’t help but think that a lesson in graphology will cause some awkward conversations between a woman and said prince when she is caught analyzing a hand-written grocery list. “Part Three: He” takes a female psychologists perspective on the mind of a man and translates it into useful guidelines for the Mr. Right Now, Mr. I’ll Be Right Back and Mr. Always Right. The question then is, how do woman feel about guides that simplify personalities down into categories? One would assume there is more to a man than what is suggested. In “Part Four: We,” Rose’s voice can finally be heard in a more personal way. She could not pick a better closing chapter to end her guide. From the perspective of a young empowered woman, the book can be shallow, and some chapters could have been left out— for example the one on makeup. This chapter talks about a traditional cause of insecurity for women, their looks, while in today’s society women are working to take the focus off of appearance and place more importance on character. Rose mentions the “Halo Effect” which suggests that a person’s appearance to others activates pre-notions of your life being positive or negative subconsciously. Studies aside, it would be refreshing to have appearance left out of things just once because of how focused mainstream media already is on external beauty. The book often feels like a generic guide to love. If Rose had added more personal experience or specific scenarios, the book might actually create a sense of community among the women reading the book. It’s also difficult to simply like a how-to guide on love that markets the idea of fairytale princes and the ultimate significant other when the equivalent to a males version of these kinds of books are like that of The Game by Neil Strauss. Until someone writes a book that portrays more than the traditional, old-school relationship roles between woman and men, preferably one that ignores all precedence that females long for love and think about it every second of every day, I‘ll be avoiding the self-help relationships section of the bookstore. However, when it comes to guides like this one, Rose writes in an ideal way that allows the reader to follow along and most importantly understand the concepts she is presenting. Rose’s format which includes relative quotes, terms with definitions and stories of different woman that pertain to the chapter lays out her messages in clear ways, making her ideas accessible to all sorts of women.